Leave Nairobi for Masaai Mara Game Reserve. Picnic lunch enroute. On arrival proceed for a game drive in search of black manned lions, elephants, leopards, cheetah, buffaloes and other plain game. Return to the campsite for dinner and overnight. 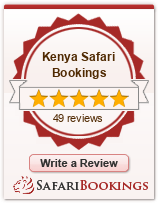 A full day spent game viewing a cross the rich, tree studded grassland and rolling hills. The famous mara is renowned for its great herds of plain game, black-maned lions, leopard and cheetah but also contains numerous elephant and virtually every type of wildlife to be found in Kenya. All meals and over night in the campsite. After breakfast, morning game drive. Have lunch in mai maiu and proceed to Amboseli National Park. Once in the park proceed for a short game drive if time permits. Dinner and overnight at the kimana campsite. Full day in Amboseli with an optional tour to maasai village, Meals and night at kimana campsite. After breakfast leave campsite for the last game drive as you leave the park for Nairobi. Picnic lunch served enroute. Arrive in Nairobi late afternoon. The optional visit to tribal villages e.g. visit to a Maasai village $ 20 PP, Ballon safari in the Mara $ 450 pp-bookable before departure.